Are you teaching your child how to speak Spanish? Or are you an educator looking for ways to supplement your curriculum? Maybe you're thinking about learning Spanish together as a family and are looking for a great curriculum. Either way, you should check out all the wonderful printables available here on MommyMaestra! One of the biggest parts of learning a new language is expanding your vocabulary. 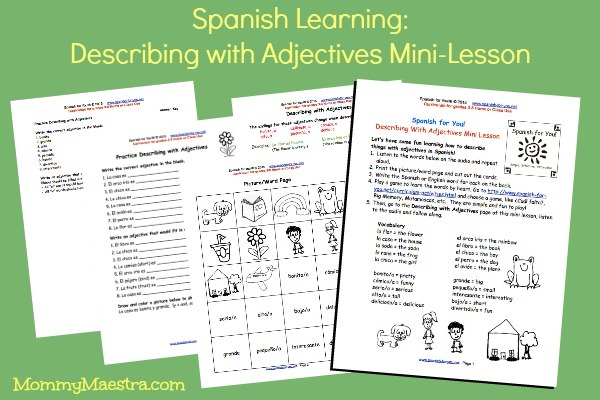 That's why I love this month's Spanish-learning freebie from our sponsor Spanish for You! The Describing with Adjectives Mini-Lesson comes with three fun activities to help your child learn describing words, as well as which words have endings that change (or don't) depending on the nouns they are describing. I also love that you can even use some of these printables with additional games/activities that you can find online. And don't worry if you aren't a fluent Spanish speaker. As with all of Spanish for You! 's excellent materials, this one comes with an audio download to help you with pronunciation. Have Fun This Summer with Brain Chase! Who Were Los San Patricios?